If we subtract this drift from each of the returns in our historical data set, we get another distribution (red dashed line) with the same shape but with a mean value equal zero, e.g., without a directional factor. 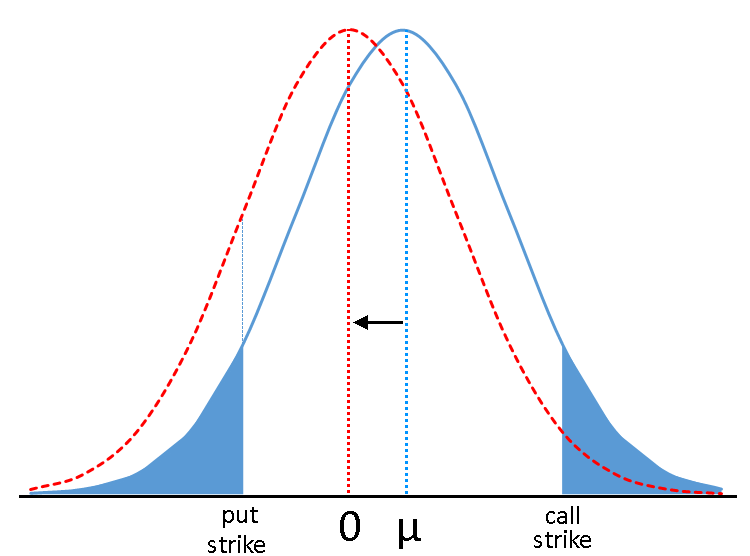 This shift inevitably influences the Fair Values of our two options: put contract becomes more expensive because the area (probabilty density) on the left of its strike increases, while calls value decreases along with the area on the right side. After that, we can recalculate the Fair Values of our option contracts on the basis of this new measure—the new driftless distribution of underlying returns. The area between the blue and green lines characterizes an underlying security directional factor. The mean 20-day return for this period is 0.82% (10.3% annualized), and after elimination of this drift, the whole Fair Value line of put options lifts up, especially near central strikes where delta is bigger than in the deep OTM area. The difference between the red and green lines stands for a pure volatility factor. This is the price that put options buyers are ready to pay for the hedging of their portfolios from drawdowns. For more about the puts volatility premium, see this research. Theoretically, the first, directional factor can be eliminated by delta-hedging, which makes the whole position delta neutral and independent from the underlying prices move. Such a portfolio would derive a return only from the second factor of option pricing—overestimation of future volatility. Of course, this is somewhat theoretical due to the hedging error because of delta convexity (gamma); and, in practice, actual profit will be dependent on the rehedging intervals. Nevertheless, that overall concept is working and allows us to evaluate the input of both factors. 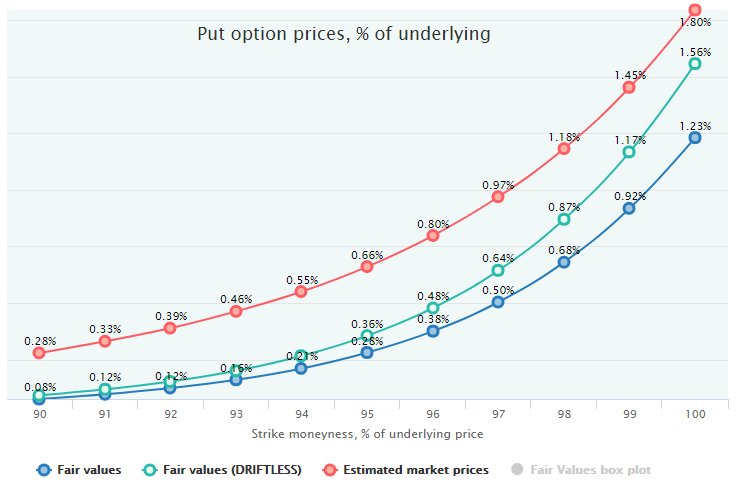 It is quite logical that the volatility factor is almost nonexistent is the upside strikes since buyers of equity options mostly seek a downside protection and are reluctant to overpay for the upside volatility. It is interesting to repeat the same exercise with similar SPY call options (20 trading DTE) but take only the Bull Market of March 2009 – November 2017 (mean return is 1.38%, 17.4% annualized). Adding the Driftless Fair value to the chart reveals some interesting results. Due to the Bull Market, the call options have been underpriced in this period, and buying them would have been a profitable strategy. It turns out, this upward trend is the sole reason for the calls underpricing. 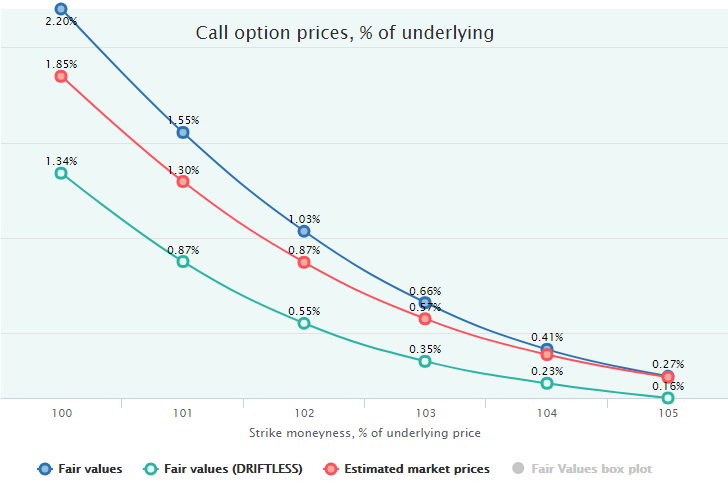 As we can see on this chart, the directional factor of underlying is very strong for calls: its elimination decreases the Fair Values significantly (green line) and places in below the Market Prices – outside of the total mispricing area. In this case, the factor of volatility overpricing works in the opposite direction and compensates some amount of the directional factor. In other words, calls implied volatility is also overstated by the market despite their overall underpricing; perhaps, the demand for the puts protection also influences the right side of the volatility smile. However, selling these calls is a losing strategy due to the following strong upward move of underlying which completely eliminates this overpricing and makes these calls attractive for buying instead of selling. It turns out that in such a market, it is profitable either to buy calls and participate in the upward move (although going against IV overpricing) or to sell them with delta-hedging and, hence, with directional factor removal and exploit the volatility overpricing factor only. 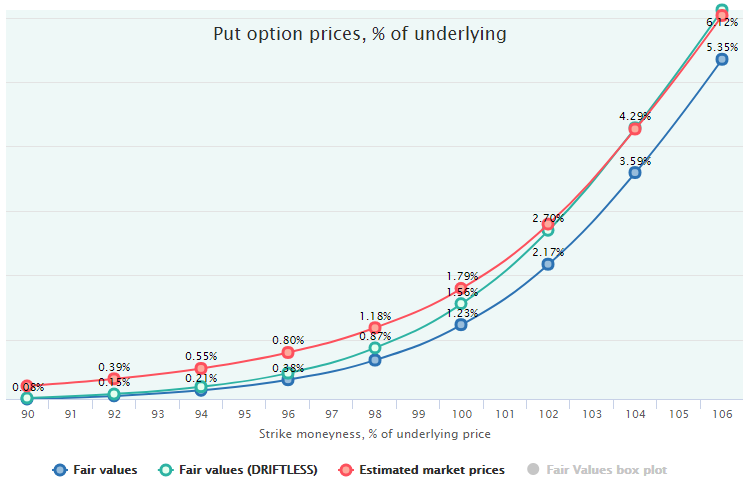 In many cases, the whole options mispricing can take place by only one factor, either a directional underlying move or a wrong estimation of probabilities by the options market.